Barefoot Rose, a blog from Cuba | A translation of the Cuban blog "La rosa descalza"
This February 23 marks five years since the death of Orlando Zapata Tamayo. This humble black native of Santiago de Cuba, dissident mason and plumber, died after carrying out an 86-day hunger strike in the prison where he was being held, as an act of protest against the conditions of his imprisonment. His death garnered wide media coverage because of the contradictory and controversial list of reasons that the Cuban government publicized against Zapata to fend off the accusations of abuse and medical neglect put forth by his family and the opposition. The official media deny that the matter involved a political dissident, but rather, that Zapata was a common criminal. However, the 2003 book, “The Dissidents,” by Rosa Miriam Elizalde and the recently deceased Luis Baez, had already included Zapata’s name and photo as a member of the opposition movement–and also, before his death, Amnesty International had declared him a prisoner of conscience. There are two constants of dictatorial regimes: that they invariably have powerful enemies as well as political prisoners. The latter are associated with the former, even if they are only peaceful compatriots and are engaging in independent discourse. Any pretext is valid so long as they can stay in power. This is why, five years after the martyrdom of Orlando Zapata, there are still political prisoners in our jails, even though the authorities insist that they are common convicts. It is because of living without freedom that individuals often choose a form of struggle that threatens their own lives. The option to abstain from eating food is a decision that tends to be linked to the desire to denounce unjust situations. A government composed of just persons should attend to these claims, rather than victimize those who sacrifice themselves and ask to be vindicated using fasting as a tool. After 56 years of the Castro regime’s government, Cubans continue to escape towards any geograpic coordinate. The lack of democracy and the oppression during this government’s tenure has caused many to launch themselves in the sea in migratory suicide missions–in which we know not how many have lost their lives–just to satiate the hunger for freedoms and rights that this society endures. 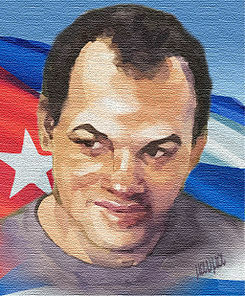 I pay homage to Orlando Zapata on the fifth anniversary of his departure–and also to the people of Cuba, who for decades have been longing for full and complete respect for their rights, and whose abusive and stagnant government causes them to die a little of hunger every day. 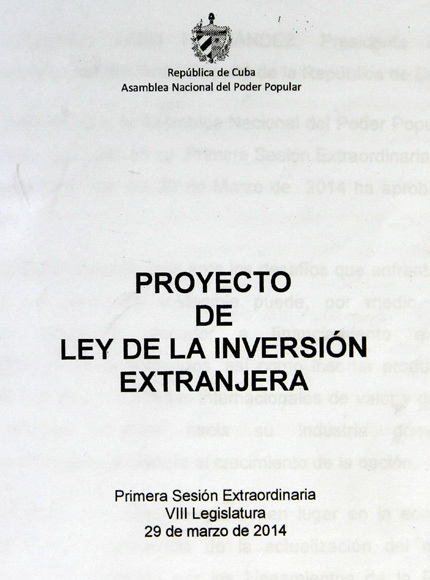 The National Assembly or Cuban parliament easily approved (nothing odd for that body when the issue is something that, although not divinely ordained, “comes from above”) the new foreign investment law. One does not need a crystal ball to know that the new legislation — like the proverbial broom* — will sweep efficiently, basically for those in power and the barriers they have created. The breathless financiers of the antiquated Cuban political model demonstrate that for la nomenklatura, the need of their wallets — or the need to upgrade,or air out, their state capitalism — is more important than to truly revive the the battered “socialist economy”. As with all laws that “are to be (dis)respected” in post-1959 Cuba, it passed unanimously, i.e., everyone was in agreement — or at least, they all raised their hands — in that caricature of a senate composed almost entirely of members of the sole legal party in Cuba, which has been in power for 55 years and which, despite calling itself Communist, really isn’t. It follows, therefore, to suggest to the Cuban authorities that to be consistent with their own laws, they should conduct an aggiornamento (update) of the philosophical foundations of their ideology, and of the historic government party. The Cuban state has long had its eyes on foreign investors. Rodrigo Malmierca, minister of exterior commerce and foreign investment, stated several months ago in Brazil that Cuba will continue to have just one political party. He was, of course, speaking to the interests of Brazilian entrepreneurs, and emphasizing the message of confidence and stability that Cuba’s governing class wants to convey so as to encourage them to do business on the island. This standard produces another discriminatory law that baits foreigners with financial benefits and tax breaks, in contrast to the prohibitive taxes imposed on Cuban nationals who launch themselves into the private sector. They took everything away from Cuban and foreign entrepreneurs when this model was imposed, and now they stimulate and favor only foreign capitalists to invest in our country. They say it’s not a giveaway, but any citizen of other provenance is placed above our own nationals, who once again are excluded from investing in the medium and large companies on their home soil. Just as our Spanish forebears did, they engage in shameless and abusive marginalization of Cubans on their own turf, and restrict Cubans’ economic role in their own national home. The state continues holding “the master key” of the hiring process. It serves as the employment agency to calm the fears of its followers and urge them to continue their unconditional support, with the established and visible promise of compensation and privilege — albeit with a diminutive, revolutionary, symbolic and coveted “little slice” of the national pie. On the other hand, the impunity that inheres to bureaucrats in management, along with the lack of respect toward Cuban society implied in their excessive secrecy, unbuttons the shirt of corruption. Some of the many examples that strike a nerve among Cubans of diverse geographic areas are: What is the state of affairs of the country? What are the revenue and expenditures of different phases of the economy? Why do they not inform the public of the annual income generated from remittances by Cuban émigrés, and how these resources are used? I could say and write much about the new law and the same old discrimination and practices contained in the same old legislation. As far as I am concerned, despite everything, the result is just another flea-bitten dog with a reversible — but no different — collar. But that would be giving too much relevance to the segregationist, shoddy and desperate hunt for money by the elite in power, which needs ever more colossal sums of evil capital to “sustain” its unsustainable bureaucracy and inefficient model. Anyway, this new law – like the proverbial broom – will always sweep clean for them. Considering their dynastic, highborn, 50-plus-year-old lifestyles, this seems to be all that matters to them. *Translator’s Note: The writer refers to a saying, “Escobita nueva barre bien” – parallel to the English a new broom sweeps clean. A group of Cubans in Cuba and its diaspora agreed to promote a roadmap for a constitutional consensus. Organizations and public figures from different generations, all ideologies, religious creeds and interests, we believe it’s good that, first, we agree on what kind of constitution we want that is established and take it as a reference for the new constitution, according to our time and reality. The management group of this project is made up of Rogelio Travieso Pérez, Rafael León Rodríguez, Manuel Cuesta Morúa, Fernando Palacio Mogar, Eroisis González Suárez, Veizant Voloi González, Wilfredo Vallín Almeida and Rosa María Rodríguez Torrado. We want to end the vicious and corrupt circle of the elite which, for decades, has set the course of our country without taking into consideration the opinions of its citizens. The constitutional road map has also been created to bring down the perverse myth born with the ruling political model, in which Cuba is only a part of its children: that extends a hand to take money from emigrants and with the other hand pushed them away and separates them from the environment to which, by right, they belong. Therefore, we are working together to seek a consensus and constitutional and legal order emanating from the citizens, their diversity, their place of residence and their plurality. Thousands of Cuban have signed the call for a constituent assembly in Cuba and we continue to call on all our compatriots, wherever they may be or reside, to join this effort, to arm ourselves with a new civilized shield of coexistence. In this course, we invite Cubans to offer their ideas on how to finally manage a Cuba for all within the law. To promote this effort, compatriots abroad created the site consensoconstitutional.com, where there is an update on this project. 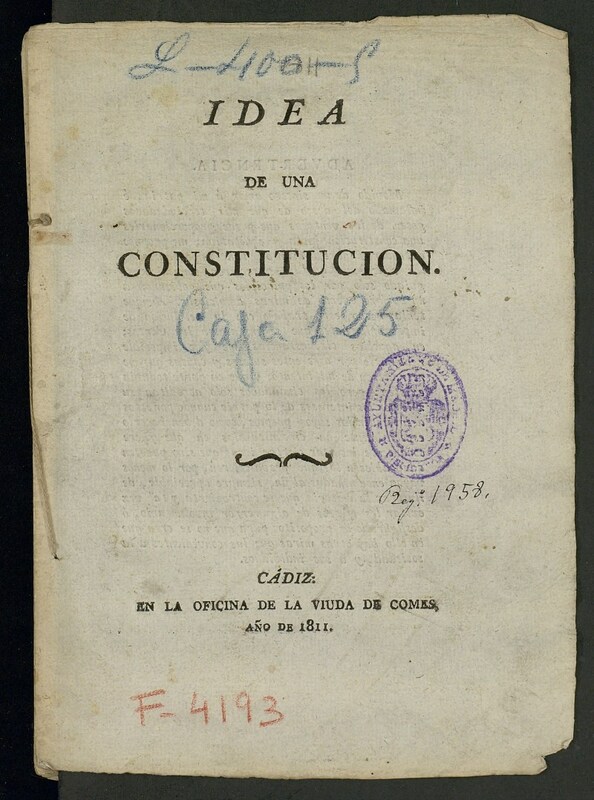 We drafted a methodology in which we encourage Cubans interested in participating are invited to submit papers in which they argue, in about ten points, the reasons why they defend this or that constitutional proposal as a point of departure toward changing the law of laws as we embark on the democratization of our nation. In May 2014, Cubans inside and outside of Cuba will begin to hold meetings in which we will discuss ideas about the process of promoting consensus. Right now, we are waking to create initiative discussion groups on the island and this design is just the beginning of a long road to justice, equity and the rule of law for all Cubans. In general the key problem is the fifty-five-year-old Castro dictatorship, or more specifically the forty-seven year rule of its original dictator, a caudillo who has left a scar on the nation with his “do as I say” mentality. It has been a period marked by verbal violence, disrespect and discrimination against anyone who thinks differently. So, what or who is there to criticize? Capitalism and the United States, of course, as well as anyone who does not fall in line or sympathize with its so-called revolution. The group in power has always been sensitive to its own interests but deaf to the real demands of society. 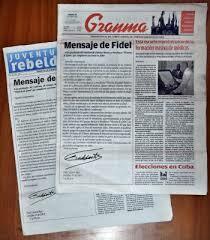 The monopoly on information in Cuba is in the hands of the state, which officially prohibits the circulation of independent publications, freedom of association and a multiparty political system. Then there was the writer and poet Heberto Padilla, founder of the organization Origenes (Origins). In the 1960s he was forced to publicly denounce his colleagues and made to commit hara-kiri with the well-worn blade of extortion. As I have said on other occasions, I personally believe that our communication professionals neither have nor feel the freedom to express what they truly desire or what is of concern to much if not all of the population. Thus there can be no true transparency of information to facilitate and encourage freedom of expression for industrial workers or for society in general. Unless they themselves turn away from the violence that destroyed Cuba’s democratic institutions, which now exist to perpetuate power and to maintain a dependent and manipulated press, they will not be able to achieve what government leaders have wanted for a long time. By “resorting to political flirtatiousness” when talking about the current system, as is routine in the Cuban media, they rely on theatrical props to give the false impression that in Cuba there is freedom. 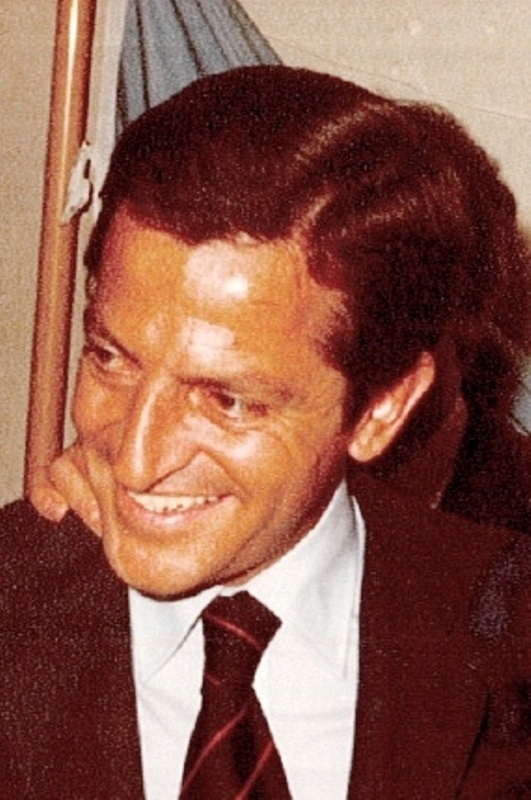 Adolfo Suarez, Spanish lawyer Catholic politician, finally extends his hand in a physical goodbye. From now on we will resort to memory, photos and audiovisuals to see him greet us with his amiable gesture of unwavering gallantry in the fight for democracy in his country. History records him as the architect of the Spanish transition. For me, he is the foundation and the pillar itself of the magnificent bringing in of democracy and the entire process of political development that happened after the death of Francisco Franco. As a public man and a decent statesman he worked for the reconciliation of Spaniards, to eradicate the vestiges of dictatorship in Spain, and to help lift his country, not to bring it to its knees it as dictators and their partisans in uniform usually do. The warm smile of this kind man — a leader without rancor who didn’t hide behind the knife of vengeance, but offered the embrace of reconciliation — earned him the love and respect of the entire world. He starred in the development of a democratic monarchy and gave lessons in respect for the institutions and laws which with the transfer of power have been maintained from 1976 until today. We Cubans, who suffer from 55 years of a dictatorship that defeated another one of seven years to remain in power and ruin Cuba, value the moral stature of politicians who serve their countries and their societies, rather than those who use a pedestal, as José Martí said, to rise above them. I remember during my childhood how the Cuban dictator criticized the caudillo of El Ferrol for his years in power and, with the passing of time, he himself broke the record for the most years in power in Cuba. Democratic societies are mourning today for the eternal loss of this citizen and politician who showed the world that intentions are demonstrated with acts not with words. May this illustrious son of Spain, an exemplary example of a democracy, rest in peace.